Looking for a good, basic grass hay with high quality nutrition, and a fresh fragrance that’s irresistible to small herbivores? Oxbow Western Timothy Hay is the ideal long-strand fiber source for keeping small animal digestive tracts functioning properly. Oxbow's most popular grass hay—with high fiber, low protein and low calcium content—is widely recommended by veterinarians. 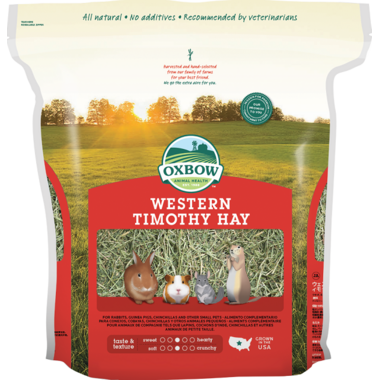 Oxbow Animal Health was the first pet food company to introduce timothy hay as a staple in the small animal diet. It is now an industry standard. Very impressed! Got double the amount for what I usually pay at my local pet store and the quality of hay is waaaay fresher! Iâ€™ll definitely be buying here from now on! Thanks Well.ca!!! I always buy Oxbow hay for my two bunnies, and it's usually hit or miss, especially when buying online. I bought 2 bags, one was okay and the other was mostly brown, so a lot of it went to waste. Overall it's a good product if you receive a fresh bag. I was not happy with the product. I had to sort through a lot of the hay as it was filled with excess debris and roots. I'm so glad they carry the large size. We use this as an addition to litter as well obviously feeding it to our rabbits - works great! Excellent customer service, supreme delivery time, great products, a touch of personal service with a thank you note included with my order. I will definitely use Well's for other products. I've had bunnies since 2003. All my bunnies past and present love this product and will only eat Oxbow Timothy Hay. Love the package size and the smell of freshness. Great product for bunnies and piggies teeth health. Have been ordering the product through this web site and very happy with the fast delivery service. I was very pleased with this product. The bunnies love it, it's fresh, not cut into little bits and it's not dusty. The value is incredible compared to the tiny bags available in the pet shops. I will buy again. My piggies love it. Best price I could find anywhere! I can't find this bag size or quality locally. Thank you for carrying this product. I am a volunteer in the Exotics Department of the Montreal SPCA, and I can vouch that the Oxbow Western Timothy Hay comes highly recommended for rabbits, guinea pigs, degus and hamsters. This is an amazing price too!!!! The bag is humongous! It looks like our bunny has plenty of food for the next 6 months. Great deal. The first bag I bought was great, very green. The second bag was garbage - mostly brown and some look like they are moldy (black spots). Looking for an alternative. This a great quality, big size, and an even better price! I would recommend getting this if you want to have hay for months on end for your rabbits! Great size at a great price! Our two rabbits eat mostly hay and I also use it as a bedding. This product helps keep them healthy. I also really like when it is on sale. I love getting this great big bag of soft fragrant timothy hay in the mail. I can't buy a bag this size at my local pet food store. The free shipping is great too,and mak the price is comparable to other brands of lesser quality. This is great quality hay for small animals... Oxbow has a deservedly great reputation, but it's not always easy to find. Being able to have such a lovely huge bag shipped right to my door is fantastic, and the price is great too. My two guinea pigs just love this hay. The best product to use. A very huge bag! Perfect for my 5 guinea pigs who eat alot! !